Our EnviroKote™ series of products are the newest technological advance spray wand chemicals on the market today. They are our non-phosphate inorganic conversion coatings. Zirconium based chemistry develops a “true” conversion coating on Ferrous and non-Ferrous substrates and enables greater corrosion protection when compared to traditional Iron Phosphate(s) as well as lower operating temperatures (80-100F). Zirconium also excels in corrosion protection as well as powder/wet paint adhesion and contains no regulated heavy metals. These new coatings will not increase phosphate levels in the effluent from the spray wand process. Phosphatizing helps prevent corrosion and prepares the metal surface for improved paint adhesion. 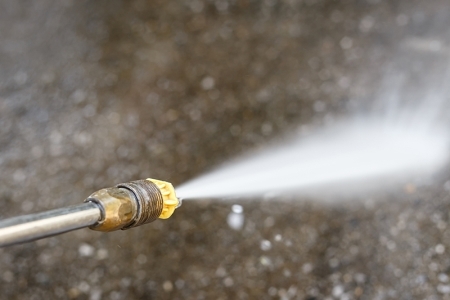 A spray wand can be a simple one-stage cleaner/phosphatizer operation for large, low-volume parts that do not require a high degree of corrosion resistance. On the other hand, they can also be used in more complex operations using cleaners, and iron phosphates that provide much better corrosion and paint adhesion results. The iron phosphate coating inhibits corrosion and improves the adhesion and durability of paint; when applied to most metals by means of steam or hot water, high pressure spray wand applications. Our cleaner coater series of products simultaneously cleans the surface; while producing and depositing a highly uniform iron phosphate coating. These products provide excellent cleaning of light to medium shop soils; drawing compounds; rust preventatives; and water soluble machining fluids. Typical contact times will vary depending on the severity of soils and types of metals being cleaned and temperature. A rinse must be used between the degreasing process and the iron phosphate process. Our EnviroPhos™ series will produce a tightly bonded iron phosphate conversion coating on steel and iron parts while slightly etching zinc, galvanized and aluminum parts. We have products that are very effective on cold and hot rolled steel, as well as cast iron parts. This series of products contain both our cleaner coater products and the stand alone coater products as described above. Optimum corrosion resistance results may be obtained by the use of a steam or hot water, high pressure wand system when using these products. These products will lay down coatings comparable to what someone might expect to find in more elaborate washer systems. Our EnviroClean™ and Solve It™ product lines were developed to clean the most tenacious soils. We have a wide variety of alkaline cleaners for practically any application. EnviroServe Chemicals has a cleaning product that can meet your toughest cleaning requirements – such as stubborn oils, grease, carbon-based soils, fatty acid soils, waxy corrosion inhibitors, and light corrosion. We have a full line of multi-metal safe cleaners as well as products developed exclusively for ferrous alloys. The industry has proven our products to be highly effective in all of these types of operations. We offer a wide variety of alkaline cleaners designed to meet the most challenging industry needs. Most products operate economically at low concentrations and temperatures. Products are moderate foaming and are ideally suited for use with automatic control equipment. Alkaline cleaners have long been the prevailing choice in the paint pretreatment industry. These cleaners are designed to remove the toughest, most tenacious soils with a lower concentration of product. Alkaline cleaners are the best type of cleaners in operations where soil loads fluctuate from day to day. These cleaners remove a variety of soils in a very cost effective manner. Alkaline cleaners in the market today operate at temperatures of between 120 and 160 °F. Neutral pH cleaners are an ideal choice when cleaning light soils. These cleaners are based on surfactants that are designed to “lift” the soils off the parts without using aggressive caustic cleaners. That makes them more environmentally friendly, while at the same time making them safer for the operators than conventional cleaners. Innovations such as low conductivity cleaners, neutral pH cleaners and rust removers will increase your plant safety without adversely affecting productivity. Contact EnviroServe to learn more about our Spray Wand Chemistry and how we can positively affect your cost and quality objectives. EnviroServe Chemicals also sells, services, and maintains manual spray wand equipment by PEM Corporation.